Remakes, remakes, remakes. Is there a reason for them to exist other than to enable cash registers to sing whilst the viewers’ collectively sigh? The word bandied around in the press release for this update is to ‘galvanise’ a new generation. Maybe that is enough of a valid concern, a calling card to grab the attention of a distracted youth to engage them in material that could otherwise be lost in the tide of time? The realisation of the idea is important though. Execution, in all its forms, is essential to the residual success. With this in mind, attention turns to this 2013 update on the Brian De Palma 1976 cult classic. Billed as more of a ‘reimagining’ than a remake, the aim here is to nod to the contemporary without disrespectfully butchering Stephen King’s core text. The contemporary nod is most easily engendered through technological reference. It is the easiest signifier as to the division between the present and the past. Therefore, on this basis, please note the use of mobile phones and viral online videos. Carrie, a girl sheltered by her extremely devout mother is a loner and an outcast. She is a bundle of frustrated confusion. A girl who wants to do ‘good’ but whose idea and notion of the normal is skewed by the environment she calls home. Her mother’s influence is an axis shift from that of those around her. One day, unaware of the mechanics of human biology, she is humiliated after experiencing her first period in the shower at school. She is panicked and has no idea why the blood is falling from her. The sneering, jeering classmates mock her and film the episode. They are later reprimanded by the school. During this period (no pun intended), Carrie goes on a voyage of discovery as to the fact that she may have the power telekinesis. What follows is a prom, pig’s blood and an infamous conclusion. Does it the ‘reimagining’ work? Well, the answer is certainly more of a ‘no’ than a ‘yes’ but let’s start with some positives. With a stoop of gawky awkwardness, Chloe Moretz drifts from scene to scene with the right dose of social pariah about her. Her gait screams downtrodden and belittled daughter/teenager. 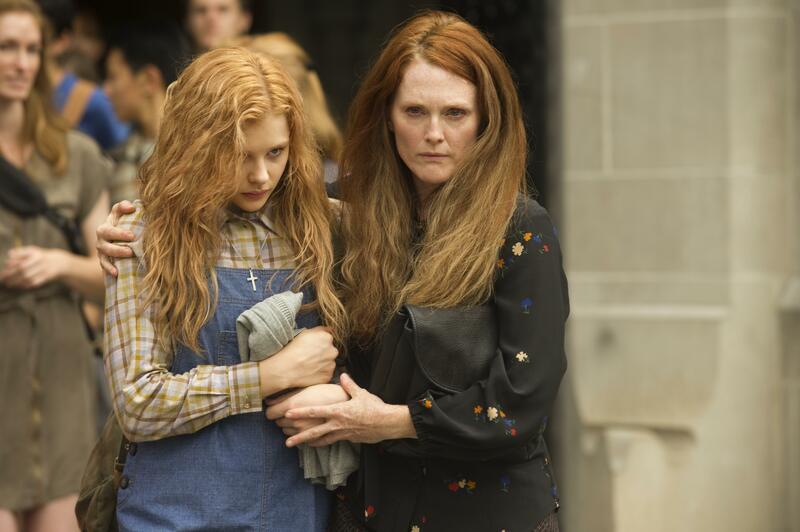 Julianne Moore is electric as the Old Testament-bashing mother and Ansel Elgort’s ‘Tommy’ is more engaging and rounded than the previous incarnation. So where does it fall down? Part of the problem lies in the cosy candy coloured cinematography that does nothing to exude edge and everything to alienate through hyper-realism. There is also an over enunciated, cliché-throbbing soundtrack to proceedings. Whereas the original film oozed unease and eerie suspense, this outing throws more effects into the mix and seems to be content to throw subtlety out of the window. Above all, as a piece, it all feels rather inconsequential and unnecessary. It lacks punch and it does not improve on what has gone before. It also fails to set alight the screen in its own right. It steps to the side of the shadow of the original through its set of competent performances, but it drowns in indifference overall. It is not a disaster, but it is a failure. All can do better than this. This entry was posted on 03/12/2013 by toomuchnoiseblog in Reviews and tagged carrie, chloe moretz, Cinema, Film, Greg Wetherall, Horror, julianne moore, movie, Release, remake, sissy spacek, stephen king.